Zaenah's Blanket Foundation, Inc. is a not for profit 501(c)(3) Foundation founded in the memory of my daughter Zaenah Mitchell, a beautiful vibrant 2 years old whose star was dimmed 20 years ago. I always wanted to make her a quilt from bits and pieces of her clothing and blankets for her to have as a keepsake when she grew up, but sadly this never came to pass. Now, Zaenah's family & friends celebrate her birthday every year! So on Dec. 30th 2009, what would have been Zaenah's Sweet 16th bithday, I had a great idea; what better way to celebrate her life than to give gifts in her memory to those born that day. I did that by gifting 16 blanket sets at Roosevelt Hospital. (By the way, that's where Zaenah was born). Why blankets you ask? Easy, the young lady who shared my hospital room had nothing to take her baby home in. So my family and I decided to give her some of the things that I had. My roommate had a boy and I had a girl; so I packed pack up the unisex yellow and green clothing along with a blanket and gave it to her. So with that thought and through one act of kindness in celebration of Zaenah's birthday; Zaenah's keepsake quilt manifested into what is now known as Zaenah's Blanket Foundation, Inc. That's it, that's how we got started...The 1st distribution took place on Wednesday, December 30, 2009. The mission of Zaenah’s Blanket Foundation, Inc. is to reduce the infant mortality rate by providing blankets to newborn families; who are in need of something warm to bring the babies home in from the hospitals and to provide a service to the community that will inspire both young and old to care for their most vulnerable members by educating them in infant/child CPR. Though blankets and quilts are the primary focus, Zaenah's Blanket Foundation, Inc. also accepts and distributes clothing, books, strollers, cribs, car seats, bottles, diapers, formula, etc. which we distribute monthly. Each gift bag distributed to the nurseries contains the following: a receiving blanket, an outer blanket and starter clothing, i.e. ; undershirts, sleepers, gowns and/or an outfit. We also add a story book which fosters the need of reading to children even at infancy, and an information card about the foundation and Infant /Child CPR. When available, additional items such as diapers, bottles, formula, rattles, pacifiers, etc. ; are also provided. We are also committed to educating caregivers in Infant/Child CPR. No child or family should suffer a tragedy due to lack of education. Now, did I mention that Zaenah's Blanket Foundation, Inc. is totally donation driven, well that means more than the tangible items we receive, it also means financial contributors, volunteers and their time, Professionals and students alike come together and we do it all; shopping, pick up, inspection, sorting, laundry, more sorting, cataloging, inventory, folding, bundling and packing, blankets, books, clothing, diapers, food, toys, cribs, walkers, bottles, car seats, puzzles, educational games, you name it we have it...but only when it's donated to us. Again, we do this month after month. However as involved as this sounds and can be, it's really a labor of love and all who participate do it out of the kindness of their hearts. Please help us to grow and continue to "wrap children in love 1 blanket at a time" and decrease infant mortality. Hugs, kisses and good wishes; today and everyday from us and the families we serve. Zaenah's Blanket Foundation Inc. hosts various community events throughout the year that address the needs of less fortunate families with infants and children ages 0-5 years old; this year is no different. It is our belief that no family or child should suffer a tragedy due to lack of education and/or resources. 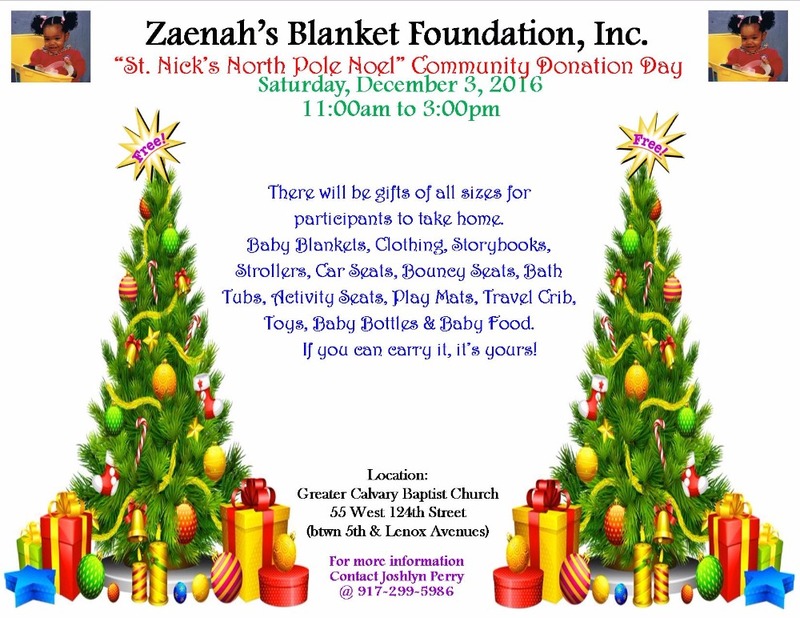 So, with this thought Zaenah's Blanket Foundation, Inc. is hosting its annual Holiday community event. This year’s theme is "St. Nick's North Pole Noel” and as always it is open to the public. Looking for a quick an easy way to give back this holiday season? Well here's your answer...and it's affordable! For $5 -$10, what you would normally spend on breakfast or lunch for 1 day; how about you brown bag it one day & use the money you saved to donate a soft, cuddly, warm baby blanket to a child in need this holiday season, to help keep them warm & healthy. A baby blanket can make all the difference, it can save a child's life. Now through thanksgiving, blanket donations can be dropped off at Plush Nails Spa located at 1455 Amsterdam Avenue New York, New York, 10027 (the uptown side of 132nd Street & Amsterdam Avenue). Hugs, kisses and good wishes today and everyday from Zaenah's Blanket Foundation, Inc and the families we serve. Zaenah's Blanket Foundation, Inc together with Omicron Chi Chi Chapter Chi Eta Phi Sorority Inc, is hosting a FREE Infant/Child CPR workshop for families with children ages 0-5 years old. 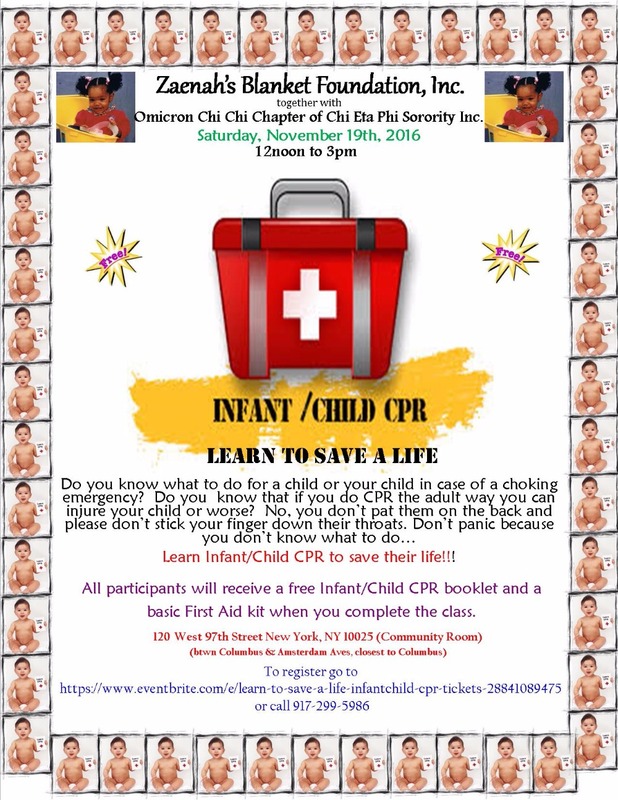 At this workshop you should expect to learn the proper hands on techniques used to perform Infant/Child CPR in the attempt to save a life. This class is for all caregivers; (parents, grandparents, older siblings (15 & above), aunts, uncles, cousins and friends). There is only 20 spaces available. Please register immediately as space is very limited. The class begins on time and latecomers will not be permitted to enter after the start of the class. 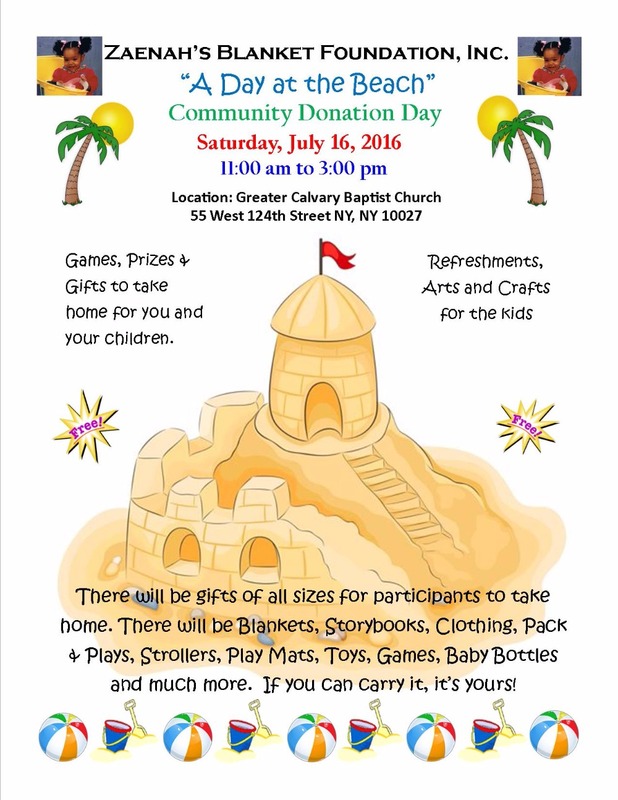 We are hosting our second annual community donation day themed "A Day at the Beach", on Saturday, July 16, 2016. this is a free event for families in need and open to the public. However we only service families with children ages 0-5 years old. Arrive expecting to play games, win prizes and have a good time. There clothing,a baby accessories and toys for the children. Additionally, there will also be a structured giveaway for big ticket items. Hope to see you there. What an AWESOME MINISTRY....continued blessings....will definitely support! Stay blessed! Sent with love and a commitment to donate annually and spread the word. Happy Giving Tuesday. God Bless. In honor of Henry Y's birthday. Thanks for the wonderful work you do on behalf of children and families in New York. Excellent way of matching resources and building community. You are truly God's humble servant.